The definitive endoderm arises when endoderm precursors, initially located in the epiblast, ingress into the anterior primitive streak and middle streak regoins, from which they emerge to form a layer beneath the epiblast. Further waves of ingressing cells form a layer in between the endoderm and epiblast, called the mesoderm. Endodermal progenitor cells give rise to the gut tube and to all endodermal tissues. In mouse development, these cells originate in the posterior epiblast (pre and early streak) and in the anterior primitive streak (mid to late streak). When the primitive streak is at its maximum length (the late streak stage), there are few or no remaining primitive endoderm precursors in the epiblast or streak, as all have ingressed and formed the endoderm. 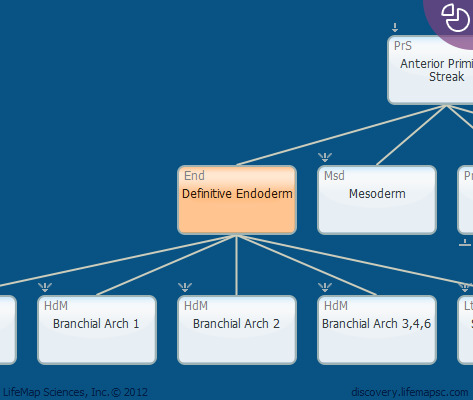 Definitive endoderm is specified at E6.5-7 in mouse embryo development.